[Updated at 11:29 p.m.] More than 670,000 New Yorkers are without power, Con Edison official John Miksad said late Monday. [Updated at 10:59 p.m.] A male was killed in Hawthorne, New Jersey, when a tree fell on a house around 7:30 p.m., Joseph Speranza, that community's fire chief, said. His death raises the U.S. death toll from the storm at least 11, including three in New Jersey. Sandy killed at least 67 people in the Caribbean as it moved north, 51 of them in Haiti. [Updated at 10:43 p.m.] The New York mayor's office reports around 10 p.m. that the city's 911 dispatchers are receiving about 10,000 calls per half hour. [Updated at 10:23 p.m.] Two children who were in a pickup that was struck by a tree in Mendham Township, New Jersey - killing a man and a woman inside - were rescued, said Morris County emergency management director Jeffrey Paul. Both children suffered injuries that were not life-threatening, according to Paul. [Updated at 10:15 p.m.] Water is entering New York's subway system from the East River, but pumps are working to get the water out, MTA spokesman Kevin Ortiz said. Asked how much damage Sandy has caused, Ortiz replied, "It's too early to tell." [Updated at 10:13 p.m.] The New York Police Department's 60th precinct station on West 8th Street in Brooklyn has been evacuated because of the partial collapse of a wall, police said. There's no flooding in the building, and no injuries have been reported, though those working there have been moved to another precinct in the area. [Updated at 10:02 p.m.] Water levels in Battery Park on the tip of Lower Manhattan rose to 13.88 feet at 9:24 p.m Monday, smashing the record high of 10.02 feet set in 1960 during Hurricane Donna, the National Weather Service reported. [Updated at 9:58 p.m.] Like LaGuardia and Kennedy airports, Newark Liberty and Teterboro - both in northern New Jersey - have been closed to Sandy-related floodwaters, the Port Authority of New York and New Jersey reports. [Updated at 9:52 p.m.] "Almost everything from 39th Street on down" is dark in Manhattan, said Con Edison spokesman Allan Drury on Monday night. The massive power outage - which alone affects 250,000 customers - was caused by flooding in substations, Drury said. [Updated at 9:48 p.m.] Two people in Morris County, New Jersey, were killed Monday evening when a tree fell on their car, the county's emergency management director, Jeffrey Paul, said in a statement. The accident was in Mendham Township. [Updated at 9:47 p.m.] A 48-year-old woman was killed Monday in Davis, West Virginia, when her car collided with a cement truck while driving on a road covered with five inches of snow, said Amy Shuler Goodwin, a spokeswoman for Gov. Earl Ray Tomblin. A 17-year-old who was in the woman's vehicle suffered injuries as well. [Updated at 9:27 p.m.] Five people have been killed in the state of New York - including a man hit by a tree while inside his Queens home - because of Sandy, said Rich Azzopardi, a spokesman for Gov. Andrew Cuomo. [Updated at 9:14 p.m.] John F.Kennedy International Airport has been closed, the Port Authority of New York and New Jersey said. At the agency's other New York airport, LaGuardia, water was covering the runway intersection, according to the National Weather Service. [Updated at 9:08 p.m.] Floodwaters have made their way into several subway stations in Lower Manhattan, MTA spokesman Kevin Ortiz said. The transportation agency reported, on its Twitter feed, that "up to 4 feet of seawater is entering subway tunnels under the East River." [Updated at 9:03 p.m.] One person was killed when a falling tree struck three family members in Mansfield, Connecticut, as they were heading Monday evening to a neighbor's home that still had power, Connecticut State Police said. Two others who suffered non-life threatening injuries were transported to Windham Hospital for treatment. [Updated at 8:57 p.m.] The Queens Midtown Tunnel is closed to traffic, meaning there are now no vehicles running on any MTA bridge or tunnels, the New York transportation agency announced. [Updated at 8:52 p.m.] The U.S. Geological Survey has issued a landslide alert, warning that intense rains "may trigger landslides on coastal bluffs, moderate to steep slopes and locally elsewhere on landslide-prone slopes in Maryland, northern Delaware, northeastern Virginia and southern Pennsylvania." 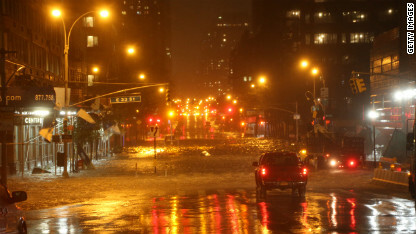 [Updated at 8:42 p.m.] "The Hudson River is flowing in on both sides" of Hoboken, New Jersey, Mayor Dawn Zimmer told CNN. Two fire stations have been evacuated, the North Hudson Sewerage Authority building "is totally flooded," and live wires are down in four locations, she added. "Many parts of the city now are impassable," Zimmer said. [Updated at 8:29 p.m.] LaGuardia Airport has been closed until further notice, the Port Authority of New York and New Jersey announced. [Updated at 8:22 p.m.] More than 2.8 million customers in 11 states and the District of Columbia are without power, utility companies report on their websites. [Updated at 8:20 p.m.] "High winds" from what was then Hurricane Sandy damaged the crane abutting the One57 skyscraper in Midtown Manhattan around 2:35 p.m., explained Mary Costello, senior vice president for Lend Lease, the property group managing the site. The crane was inspected last Friday, she said. [Updated at 8:10 p.m.] Superstorm Sandy officially made landfall Monday evening along the coast of southern New Jersey, the National Hurricane Center reported. [Update at 8:09 p.m.] A man was killed by a falling tree in Queens, a borough of New York City, fire department spokesman Frank Dwyer said. The 30-year-old man was inside his house when the tree fell on him, said New York police spokesman John Grimpel. [Update at 8:02 p.m.] At 12.75 feet, water levels in the Battery, on the southern tip of Manhattan, went at least 2.75 feet higher than the previous record - set in 1960, when Hurricane Donna hit - the National Weather Service reports. [Updated at 7:44 p.m.] "The whole north side of" Seaside Heights, New Jersey, "is totally under water" - rising halfway up most front doors - the community's police Chief Thomas Boyd said. A 50-foot piece of boardwalk was ripped up and floated away from the ocean all the way to the bay. [Updated at 7:23 p.m.] Weather authorities reported a storm surge of 12.4 feet in Kings Point, on Long Island's northwest coast about 10 miles from the New York City borough of Queens. A surge of 7.2 feet was seen in Manhattan's Battery district, with a 7.5 foot-high surge reported in Sandy Hook, New Jersey, according to the National Hurricane Center. [Updated at 7:13 p.m.] More than 2.2 million customers are without power in 11 states and the District of Columbia, according to data from utility companies. [Updated at 7:06 p.m.] Even though it has sustained winds of 85 mph, Sandy is no longer considered a hurricane, the National Hurricane Center reported in a 7 p.m. update. The Miami-based agency said it is reclassifying the storm because "Sandy has continued to lose tropical characteristics." Moving west-northwest at 28 mph, the storm is centered about 30 miles east-northeast of Cape May, New Jersey, and 20 miles south of Atlantic City, New Jersey. [Updated at 6:59 p.m.] Water from the Atlantic Ocean has gone over the boardwalk and is now flooding the streets of Asbury Park, New Jersey. About 75 miles south in Atlantic City, Montgomery Dahm said there was flooding next to the convention center and up to the steps of his restaurant, Tun Tavern. "I've been down here for about 16 years, and it's shocking what I'm looking at now," Dahm told CNN. "It's unbelievable. I mean, there are cars that are just completely underwater in some of the places I would never believe that there would be water." [Updated at 6:51 p.m.] A wind gust of 94 mph was recorded in Eatons Neck, on the northern coast of Long Island about 35 miles east of New York City, said CNN's Chad Myers. [Updated at 6:46 p.m.] As they were Monday, Amtrak trains in the Northeast Corridor won't be running again on Tuesday. [Updated at 6:37 p.m.] About 7,700 flights were canceled around North American on Monday due to the storm, the flight-tracking service FlightStats.com reports. More than 2,800 flights - at least - have been called for Tuesday. [Updated at 6:26 p.m.] Claudene Christian, one of two missing people from the HMS Bounty, has been found dead, the U.S. Coast Guard said. The ship sank off the North Carolina coast earlier Monday, and 14 crew members were subsequently rescued. The Coast Guard is still looking for 63-year-old Robin Walbridge, the ship's captain. [Updated at 6:13 p.m.] More than 1.5 million customers are without power due to Sandy, about double the amount just a few hours earlier. [Updated at 6:11 p.m.] Some 6,700 National Guard troops are on active duty in seven states due to the hurricane, the Defense Department said. Another 61,000 troops are available. [Updated at 6:03 p.m.] New Jersey Gov. Chris Christie said evacuations are no longer possible, and that those who stayed behind cannot count on authorities to help them. Rescuers won't be sent out "until daylight tomorrow," he added, citing "all the various hazards." "I'm very disappointed in the fact that some decided to disregard my instruction, in fact my order, and I'm concerned that it might lead to the loss of life," Christie said. [Updated at 5:59 p.m.] All buildings on New York's 57th Street, between 6th and 7th avenues, and "all exposed buildings" on 56th Street, between those same two avenues, have been evacuated due to the partial collapse of a crane near a skyscraper under construction, the mayor's office announced. [Updated at 5:47 p.m.] The 4.55 inches of rain that fell Monday onto Atlantic City, New Jersey, shattered the former record of 2.33 inches, which was set in 1908. [Updated at 5:37 p.m.] Broadway shows will be canceled Tuesday night, as they were Monday, because of the storm, the Broadway League announced. [Updated at 5:33 p.m.] All four of New York City's bridges over the East River - the Brooklyn, Manhattan, Williamsburg and Queensboro bridges - will be closed at 7 p.m., the city's mayor said. [Updated at 5:19 p.m.] The Key Bridge in Baltimore, the 1.6-mile span that crosses the Patapsco River, is closed, Maryland's government announced. [Updated at 5:06 p.m.] Hurricane Sandy is speeding toward the East Coast, moving west-northwest at 28 mph, the National Hurricane Center said in its 5 p.m. advisory. The storm is centered about 30 miles east-southeast of Cape May, New Jersey, and 40 miles south of Atlantic City, New Jersey. [Updated at 5:01 p.m.] More than 3,200 people spent Sunday night in 112 Red Cross shelters in nine states, the Red Cross said. That number is expected to increase significantly as Sandy comes ashore. [Updated at 4:59 p.m.] All federal government offices in and around Washington will be closed Tuesday - just as they were Monday - due to the hurricane. [Updated at 4:31 p.m.] The Red Cross says that Sandy has already forced the cancellation of about 100 blood drives, a number that is expected to rise in the coming days. In a news release, the organization's chief medical officer, Dr. Richard Benjamin, said, "It is critical that those in unaffected areas make an appointment to donate blood as soon as possible." [Updated at 4:14 p.m.] In just two hours, the number of customers without power because of Hurricane Sandy has more than doubled. More than 765,000 in seven states have no electricity, with New York and New Jersey being the most affected states with more than 220,000 outages each. [Updated at 4:11 p.m.] It's not just rain and wind causing problems. It is already snowing in parts of the Appalachian Mountains, one effect of the superstorm.West Virginia has declared a state of emergency, while North Carolina Gov. Beverly Perdue has declared a state of emergency for 24 counties in the western part of her state due to snow. Blizzard warnings are in effect for some areas, with as much as 30 inches of snow possible in locales above 4,000 feet. [Updated at 4:03 p.m.] Hurricane Sandy retained its strength Monday afternoon with 90 mph sustained winds, the National Hurricane Center reports in its 4 p.m. advisory. Moving northwest at 28 mph, the storm is centered 110 miles southeast of Atlantic City, New Jersey, and 175 miles south-southeast of New York City. [Updated at 3:58 p.m.] Gusts in excess of 74 mph - hurricane-force winds - have been reported along the coast of Long Island, New York, according to the National Weather Service. [Updated at 3:51 p.m.] The partial collapse of a giant crane on New York's West 57th Street, just blocks from Columbus Circle, has prompted the city's Office of Emergency Management to urge all occupants of nearby buildings to evacuate to lower floors immediately. [Updated 3:43 p.m.] On its Twitter feed, Boston's MBTA shows a tree down near a Green Line stop in Newton. All service on the Boston-area transit service is now suspended, the agency notes. [Updated at 3:33 p.m.] The Tappan Zee Bridge, which extends across the Hudson River about 25 miles north of New York City, will close to traffic starting at 4 p.m., Gov. Andrew Cuomo announced on Twitter. [Updated at 3:24 p.m.] Newark, New Jersey, is experiencing high winds and flooding, though the city's mayor is warning conditions should only deteriorate. "We have an intensity of water coming into our city that we anticipate getting worse and worse," Mayor Cory Booker told CNN. He expressed fears about what the storm surge around the 8 p.m. high tide will do to New Jersey's most populated city. [Updated at 3:10 p.m.] Watch raw video of Coast Guard crews rescuing people from the HMS Bounty off the North Carolina coast. [Updated at 3:00 p.m.] Just blocks from Manhattan’s Columbus Circle, an arm of a giant crane dangles from a skyscraper that is under construction. The crane had been positioned firmly before the effects of Hurricane Sandy began to be felt in New York City. The West 57th Street building, known as One57, is a high-rise that will feature some of the city's most expensive apartments. New York police and fire crews are on the scene, and part of the street has been closed off as a precaution. [Updated at 2:48 p.m.] Ocean City, Maryland, experienced "probably the highest storm surge that we've had ... since Hurricane Gloria in 1985," Mayor Rick Meehan said. Sandy has already caused beach erosion and significant flooding. But there have been no reported injuries or calls for help, the mayor said, in part because of an evacuation order. [Updated at 2:39 p.m. ET] About 2,000 National Guard troops have been placed on active duty in seven states - Connecticut, Delaware, Maryland, New Jersey, New York, Massachusetts and Virginia - because of the hurricane. The number is up from approximately 1,500 who had been activated Sunday night. [Updated 2:13 p.m. ET] Nearly 300,000 customers are without power in seven states because of Hurricane Sandy, according to figures from power companies. New Jersey tops the states in outages with about 92,000 customers without electricity, followed by New York with 90,000. [Updated 2:04 p.m. ET] Hurricane Sandy is rapidly accelerating toward the northwest at 28 mph, the National Hurricane Center said in its 2 p.m. ET advisory. Sandy remains a Category 1 hurricane with maximum sustained winds of 90 mph with gusts 110 mph, forecasters said. [Updated 1:48 p.m. ET] Atlantic City, New Jersey, will be under a curfew Monday night, as Hurricane Sandy approaches landfall, a city official told CNN. "There will be a curfew tonight beginning at 6 p.m. until 6 a.m. for the entire Atlantic City area," Capt. Frank Brennan of the Atlantic City Police Department said. [Updated 1:39 p.m. ET] The New York Stock Exchange will be closed again Tuesday because of Hurricane Sandy, the exchange said. Track the economic impact of Hurricane Sandy with CNNMoney.com. [Updated 1:29 p.m. ET] Hurricane Sandy's devastating windy march up the U.S. East Coast is expected to cause as much as $10 billion in insured losses, according to a disaster modeling firm, CNNMoney reports. [Updated 1:22 p.m. ET] Sustained tropical storm-force winds of 41 mph are now being reported at Boston's Logan International Airport, the National Weather Service said on Monday afternoon. [Updated 1:18 p.m. ET] "Jimmy Kimmel Live" has canceled its broadcast on Monday from the Harvey Theater at Brooklyn Academy of Music. In a statement obtained by CNN Entertainment, the show said the call was made "in the interest of the safety of our studio audience." [Updated 1:15 p.m. ET] President Obama has declared a state of emergency for the state of Delaware due to Hurricane Sandy, according to a release from the White House. [Updated 1:02 p.m. ET] President Barack Obama called on Americans to heed local storm evacuation orders Monday. Anyone who doesn't follow evacuation orders, he said, is "putting first responders in danger." [Updated 1:00 p.m. ET] President Barack Obama said Monday he isn't worried about how Hurricane Sandy might affect the election. "I am not worried at this point about the impact on the election. I'm worried about the impact on families. I'm worried about the impact on first responders. I'm worried about the economy and transportation," he told reporters. "The election will take care of itself next week." [Updated 12:59 p.m. ET] Gas prices are likely to spike in the days after Hurricane Sandy rips through the Northeast, but they should drop back down before too long, CNNMoney reports. [Updated 12:56 p.m. ET] Hurricane Sandy is a powerful storm that will affect millions of people, President Obama said Monday. "We are certain that this is going to be a slow-moving process through a wide swath of the country, and millions of people are going to affected," Obama said, speaking to reporters from the White House after a Situation Room briefing on the storm. [Updated 12:42 p.m. ET] If your power goes out, don’t try to fix it yourself, New Jersey Gov. Chris Christie said Monday. “If you do not have power, please do not choose today as the time you decide to tap into your creative juices and jerry-rig a power source. … If it looks stupid, it is stupid,” he said. By Monday afternoon, more than 35,000 customers had lost power throughout the state. [Updated 12:28 p.m. ET] As of noon today, water levels are already as high as 5.2 feet above tidal predictions in some areas. The National Oceanic and Atmospheric Administration has a look at water levels up and down the eastern seaboard. [Updated 12:24 p.m. ET] There have been more than 8,900 flight cancellations so far as a result of Hurricane Sandy, according to flight tracking site FlightAware.com. Get CNN.com's full travel update. [Updated 12:23 p.m. ET] About 116,000 consumers in seven states are without power, according to information from power providers' websites. [Updated 12:19 p.m. ET] Even with rains from Hurricane Sandy, guards are still standing guard at the Tomb of the Unknowns at Arlington National Cemetery. Editor's Note: A photo of the Tomb of the Unknown Soldier that was being widely retweeted Monday has been removed from the "This Just In" blog, because it was causing confusion despite a CNN note that the photo was taken last month. [Updated 12:16 p.m. ET] Ocean City, Maryland, is seeing substantial flooding. [Updated 12:13 p.m. ET] Both the Obama and Romney campaigns have canceled events through Tuesday because of Hurricane Sandy. Follow coverage at the CNN Political Ticker. [Updated 12:11 p.m. ET] New York is warning food sellers, gas stations, cab companies and other businesses: No price gouging in Sandy’s wake. State Attorney General Eric Schneiderman issued an open letter saying his office is prepared to go after anyone who breaks the law. [Updated 12:09 p.m. ET] The pier in Ocean City, Maryland, has been destroyed, according to this Twitter post. [Updated 12:04 p.m. ET] Officials are evacuating several hundred people from west Atlantic City, an area filled with many single-story motels where water levels are "dangerously high," said county spokeswoman Linda Gilmore. "Conditions are deteriorating as we speak," she said. "This storm is unprecedented." [Updated 12:02 p.m. ET] A replica of the HMS Bounty has sunk at sea, a Coast Guard official told CNN's Ashleigh Banfield. Fourteen people were rescued from that ship and two are still missing at sea, Vice Adm. Robert Parker said on CNN. [Updated 11:54 a.m. ET] CNN viewers say they are stranded in Brooklyn, New York. [Updated 11:52 a.m. ET] New York Mayor Michael Bloomberg warned that the city is “well within the danger zone” of the storm, and said parts of the city could see significant storm surges between 6 p.m. and 10:30 p.m. Monday night. [Updated 11:50 a.m. ET] Flooding at Old Dominion University in Norfolk, Virginia. [Updated 11:42 a.m. ET] Atlantic City is under extremely heavy flooding in many areas, police tell CNN. The tide is starting to go down, but when Hurricane Sandy makes landfall Monday night, officials expect flooding to become far worse, the city police department said. [Updated 11:41 a.m. ET] More than 35,500 customers of United Illuminating in Bridgeport, Connecticut, will lose power around noon when a power station will be compromised by floodwaters, CNN affiliate WFSB reports. [Updated 11:32 a.m. ET] President Obama will deliver a statement after his White House Situation Room briefing on Hurricane Sandy at 12:45 p.m. ET, according to a release from the White House. [Updated 11:28 a.m. ET] The Delaware Emergency Management Agency calls this “a pretty vivid visual example of why you should not be venturing out on the roads in Delaware" durring Hurricane Sandy. Level 2 driving restrictions are in place in the state. The agency posted the photo on its official Facebook page. A flooded Delaware road Monday morning. [Updated 11:18 a.m.] The National Weather Service is reporting 24-foot seas off New Jersey. [Updated 11:11 a.m.] Connecticut is banning trucks from highways, Gov. Dan Malloy announced. Highways will also be closed to all vehicles beginning at 1 p.m.
“Wind gusts will soon exceed 50 mph; travel is dangerous,” he said on Twitter. [Updated 11:10 a.m.] Power officials were reporting nearly 45,000 customers without electricity across 10 states on Monday morning. 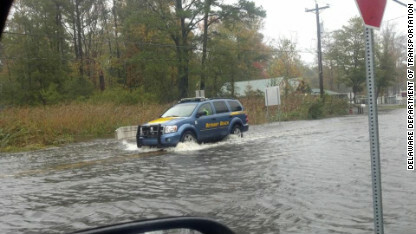 [Updated 11:07 a.m.] Hurricane Sandy has begun flooding areas of Norfolk, Virginia. This video was posted on YouTube. [Updated 10:54 a.m.] Airlines have canceled thousands of flights ahead of Hurricane Sandy, and stranded travelers shouldn't expect any relief until the weekend, CNNMoney reports. 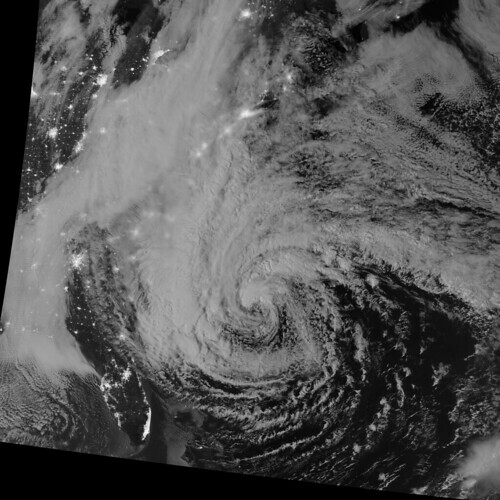 [Updated 10:51 a.m.] NASA will be providing live views of Hurricane Sandy from space. [Updated 10:49 a.m.] The impact of Hurricane Sandy will be big enough to lower the country’s gross domestic product, economists tell CNNMoney. The losses can’t yet be calculated, but will include billions in property damage, lost business, lost stock market trades, and more. [Update 10:46 a.m. ET] If you're in the storm's path, the Department of Homeland Security wants you to take steps to conserve your cellphone's power. [Update 10:42 a.m. 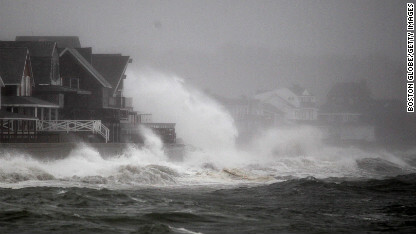 ET] Hurricane Sandy intensified on Monday morning, the National Hurricane Center said. Maximum sustained winds have increased to 90 mph with gusts to 115 mph. [Update 10:38 a.m. ET] To prepare for the possibility of flooding, New York officials are closing two tunnels into Manhattan and calling for the deployment of 1,000 additional National Guard troops, Gov. Andrew Cuomo said. The Holland Tunnel and the Hugh L. Carey Tunnel are “prone to flood” and will close at 2 p.m. Monday, Cuomo said. [Update 10:33 a.m. ET] The city of Hoboken, New Jersey, is prohibiting the use of personal vehicles after 4 p.m. ET, CNN affliate WABC reports. The station also says streets near the Atlantic City boardwalk are beginning to flood and tidal waters are crossing the main oceanfront road in Cape May, New Jersey. [Update 10:28 a.m. ET] Chase and Citibank are waiving overdraft, ATM and late fees for customers in New York, New Jersey and Connecticut, Time.com reports. [Update 10:15 a.m. ET] All public transportation services in Boston will be suspended at 2 p.m. Monday. [Update 10:06 a.m. ET] The Connecticut Department of Transportation has ordered the closure of all state highways as of 1 p.m. ET. [Update 9:57 a.m. ET] Waves are crashing ashore near the Verrazano-Narrows Bridge in Brooklyn, New York. [Update 9:51 a.m. ET] Power officials now say Hurricane Sandy could affect 60 million people across the eastern U.S., an increase of 10 million from what was forecast on Sunday. Forecasts now predict #Sandy could affect as many as 60 million people across the Eastern US-up from 50M yesterday. [Update 9:48 a.m. ET] Wind gusts could reach 80 mph this afternoon and into the evening in New York City, the National Weather Service says. [Update 9:21 a.m. ET] The U.S. Coast Guard has rescued 14 people from the tall ship HMS Bounty, but two are missing, a Coast Guard official tells CNN. The ship was without propulsion and taking on water off North Carolina. [Update 9:15 a.m. 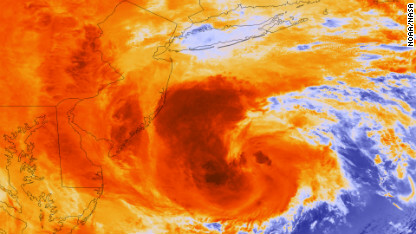 ET] NASA captured an infrared image of what Sandy looked like overnight as it moved up the East Coast. [Update 9:07 a.m. ET] Hurricane Sandy has shut down concerts in the New York, New Jersey, Philadelphia area, MTV reports. [Update 9:02 a.m. ET] Flooding has begun in Ventnor City, New Jersey, about 60 miles southeast of Philadelphia. [Update 8:46 a.m. ET] Connecticut Gov. Dan Malloy says the high tide at midnight has the potential to cause "unprecedented damage." [Update 8:39 a.m. ET] The storm is apparently breaking up parts of the Atlantic City boardwalk. “Because of the combination of that and the large size, this will be a long duration event for many people along the coast and inland, and a lot of life-threatening hazards here,” he said. Powerful winds, heavy rainfall and flooding are likely. “This is going to be a big problem for a lot of folks,” he said. Virginia's Department of Emergency Management is warning of blizzard conditions in two counties until Wednesday. [Update 8:23 a.m. ET] Hurricane Sandy is affecting air travelers around the world, including flights from airlines based in the Middle East and Australia. [Update 8:07 a.m. ET] Officials in New York City are keeping a close eye on how high the seawater is rising, Con Edison spokesman Alfonso Quiroz said. Since many of the city’s electrical cables are underground, flooding could cause significant damage. “If the water gets too high, we will preemptively shut down some pieces of equipment…because it is easier for us to make restoration once the water goes down,” Quiroz said. [Update 8:05 a.m. ET] The Coast Guard says the weather is preventing it from launching a rescue operation for the crew of the 180-foot, three mast tall ship HMS Bounty, which was taking on water and without propulsion in the Atlantic off North Carolina. The 17-person crew is in two lifeboats and wearing cold-water survival suits, the Coast Guard says. See the report from CNN affiliate WTKR. [Update 7:58 a.m. ET] The National Hurricane Center's 8 a.m. ET update shows no changes in Hurricane Sandy since the 5 a.m. ET update. "Sandy now moving north-northwestward and accelerating...expected to bring life-threatening storm surge and coastal hurricane winds plus heavy Appalachian snows," the forecast advisory said. Sandy's maximum sustained winds remain at 85 mph. It is a Category 1 hurricane. [Update 7:51 a.m. ET] The dangers from this storm extend far from the East Coast. The National Weather Service says wave heights could reach 28 feet in Lake Michigan on Monday night. They could hit 31 feet on Tuesday. [Update 7:40 a.m. ET] U.S. stock exchanges will be closed Monday as Hurricane Sandy bears down on New York. Read the CNNMoney report here. [Update 7:34 a.m. ET] Delaware Gov. Jack Markell called on residents to follow the state’s driving restrictions, which went into effect Monday morning as Sandy approached. “The biggest concerns, the rain and the wind together make driving conditions absolutely miserable so we put in a driving restriction today,” he told CNN. The restrictions say that only essential personnel can drive as of 5 a.m. Monday. [Update 7:22 a.m. ET] The 17-member crew of the tall ship HMS Bounty has abandoned the vessel in the Atlantic Ocean 90 miles southeast of Hatteras, North Carolina, CNN affiliate WTKR reports. "My biggest concern is just people not taking it seriously and not taking the proper precautions. We still have some time for people to get ready... We anticipate there could be many days without power afterward." [Update 7:13 a.m. ET] President Obama has canceled a campaign event in Orlando on Monday to stay at the White House and monitor federal storm preparations. "Due to deteriorating weather conditions in the Washington area, the president will not attend today's campaign event in Orlando. The president will return to the White House to monitor the preparations for and early response to Hurricane Sandy," White House press secretary Jay Carney said in a statement. Read CNN's Candy Crowley on how Hurricane Sandy is affecting the presidential campaign. [Update 7:04 a.m. ET] Some people have not heeded evacuation orders and are putting emergency responders in rescue situations, Delaware's governor says. [Update 6:45 a.m. ET] Maryland Gov. Martin O’Malley tells CNN's Soledad O'Brien that power crews from as far away as Texas and Mississippi are in his state and prepared to make repairs to its power grid. [Update 6:25 a.m. ET] Delaware's governor has ordered all drivers other than those providing essential services to stay off the state's roads today, CNN affliate WBOC reports. [Update 5:59 a.m. ET] MegaBus has canceled numerous services in the Northeast through noon on Tuesday and is offering customers booked on other trips through Tuesday in Virginia, Maryland, Delaware, Pennsylvania, New Jersey, New York, Connecticut, Rhode Island, Massachusetts and the District of Columbia the chance to reschedule at no charge. Here is the full list of cancellations. "All Acela Express, Northeast Regional, Keystone and Shuttle services are canceled for trains originating on that date. Also Empire Service, Adirondack, Vermonter, Ethan Allen and Pennsylvanian train services are suspended, along with the overnight Auto Train, Capitol Limited, Crescent, Lake Shore Limited, Palmetto and Silver Meteor trains. Exceptions: The Maple Leaf (Trains 63 & 64), will operate only between Toronto, Ontario, Canada and Albany-Rensselaer, N.Y., rather than originating and terminating at New York City; the Carolinian (Trains 79 & 80), will operate only between Charlotte and Raleigh rather than originating and terminating in New York City; the Silver Star (Trains 91 & 92) will operate only between Jacksonville, Tampa and Miami, Fla., rather than originating and terminating in New York City. Piedmont service (Trains 73-76) within North Carolina will operate normally." Further updates on Amtrak service will come after 6 p.m. Monday or as needed, the website said. [Update 5:36 a.m. ET] As Hurricane Sandy closes in on the Northeast, residents are scrambling to prepare. Amy Mueller Campbell told CNN affiliate WMUR she had to drive almost 30 miles - from Nottingham, New Hampshire, to Manchester, New Hampshire - just to find a five-gallon gasoline container. She'll use it to get fuel to power her home generator. [Update 5:13 a.m. ET] Hurricane Sandy is playing havoc with international air travel. London's Heathrow Airport says 45 outbound flights to New York, Newark, Baltimore, Washington, Boston and Philadelphia have been canceled. Another 12 inbound flights have been scrubbed. [Update 5:12 a.m. ET] The National Hurricane Center says "a little strengthening is possible" before Hurricane Sandy makes landfall late Monday or early Tuesday. [Update 5:05 a.m. ET] Hurricane Sandy strengthened early Monday with winds of 85 mph, the National Hurricane Center said. [Update 4:49 a.m. ET] Anna Kate Twitty, a spokeswoman for the Red Cross, was just on CNN and said the organization has multiple shelters across seven states where evacuees can find "a safe place, a warm meal and emotional support." To find a shelter, go to redcross.org, call 1-800-Red-Cross or download the free Red Cross hurricane app for iphone and android users. [Update 3:54 a.m. ET] The Coast Guard is responding to a distress call from a ship that is part of the popular culture. The HMS Bounty, a tall ship built for the 1962 movie "Mutiny on the Bounty," is taking on water off the coast of North Carolina - about 160 miles from the center of Hurricane Sandy. The Coast Guard says it has “diminished search and rescue capabilities due to the storm.” Seventeen people are on board. [Update 1:55 a.m. ET] Various primetime shows that are produced in New York (such as, "30 Rock," "Smash," "Elementary," "Person of Interest") are being shut down Monday, according to Deadline.com, but the opposite appears to be the case with late night shows. Deadline says Letterman, who once taped a show during a blizzard, will go on - as will Jimmy Fallon. [Update 1:50 a.m. 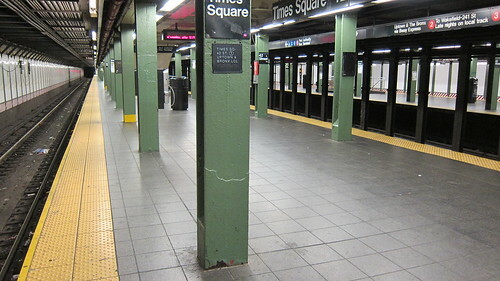 ET] The MTA has posted some incredible photos of a deserted New York on its Flickr feed. Sandbags piled on Broadway. Grand Central Terminal with not a soul in sight. An eerie feel. [Update 12:50 a.m. ET] The National Hurricane Center says Sandy is about to make its turn toward the north. The forecast map shows the storm hitting the Jersey shore. [Update 12:35 a.m. ET] 1.2 million: That's the number of college students who will stay home Monday, according to a count by CNN's Chandler Friedman of colleges in the regions likely affected by the storm. [Update 12:10 a.m. ET] President Barack Obama has approved Connecticut, Pennsylvania and New Jersey's request for emergency declarations. Earlier, several other states also requested such declarations, and the president signed them as well. Among them: New York and Massachusetts. [Update 12:02 a.m. ET] The New York Stock Exchange has announced it will close all markets – not just floor trading operations – on Monday. The stock exchange rarely shuts down for weather-related emergencies: Hurricane Gloria in 1985, and a snowstorm in 1969 mark brought the exchange to a halt. Follow CNN's full coverage of the potential "superstorm." For state-by-state plans, advice on how to prepare, photos, Sandy's already deadly path in the Caribbean, and more, follow CNN.com. Came across this post today it's been over a month since the storm and i still can't believe people are still cleaning up there houses. I have friends that are still not back in their homes in Long Beach long Island. Sandy was a crazy storm. The wind damage is incredible. The Storm surge is even worse.